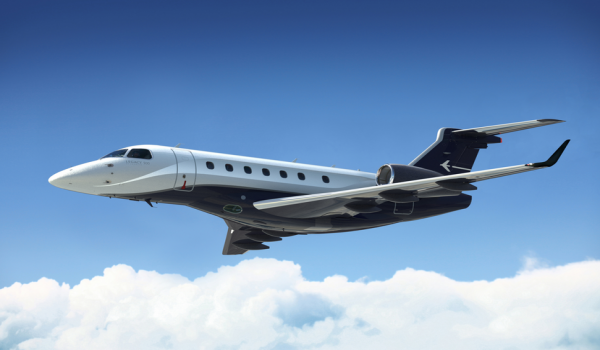 The Legacy 450 enters the market this year as the fastest mid-light jet, featuring the only true clean-sheet design in its class and unmatched technology and performance in its segment. The aircraft has a best-in-class top cruising speed of Mach 0.83 (463 knots), flying up to 40 knots faster than its closest competitor. It has a range of 2,575 nautical miles (4,769 kilometers) with four passengers, including NBAA IFR fuel reserves. 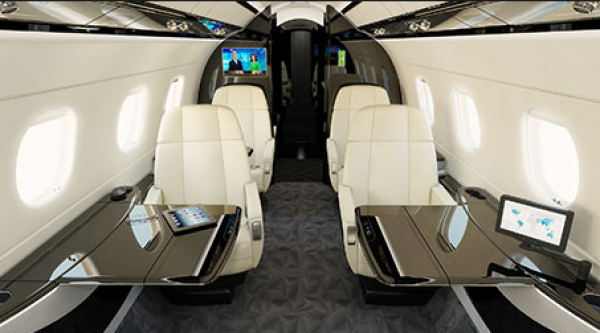 The Legacy 450 comfortably seats seven to nine passengers and is the only mid-light jet featuring a stand-up cabin – 6 feet tall – with a flat floor. 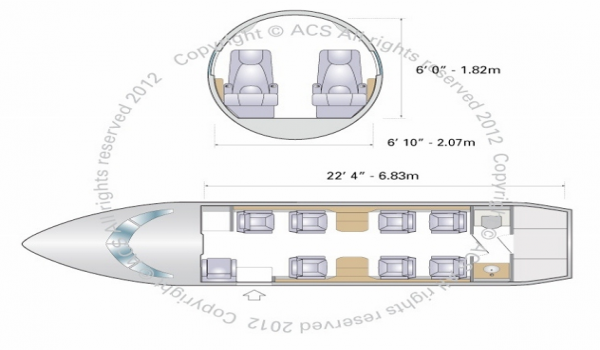 Its cross section – 6 feet 10 inches – is the largest in class, five inches wider than its nearest competitor. Passengers can relax in full-reclining seats with windows perfectly positioned at each seat. Additionally, there are two fully berthing seats. 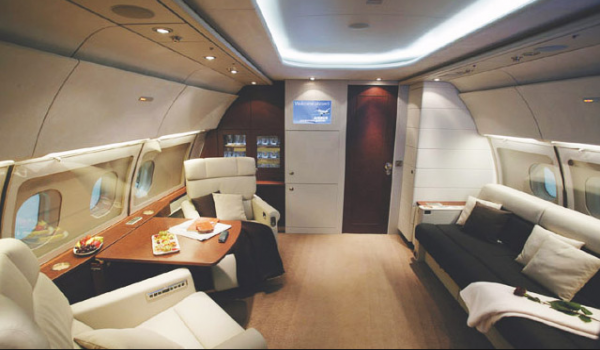 The quiet environment is enhanced by a maximum cabin altitude of only 6,000 feet, the best cabin pressurization in class. A wet galley, the only one in its category, also is available, with hot and cold water and the option for amenities such as microwave and conventional ovens, a refrigerator, china and crystal. The cabin delivers a wide array of entertainment options. The Honeywell Ovation Select package offers a full HD video system, with access to movies, game consoles and the Internet, and cabin control, through portable devices. Legacy 450 is the first mid-light jet with full fly-by-wire technology and side-stick flight controls, which makes it easier to fly. The digital controls produce a smoother flight, improve safety and performance, and reduce pilot workload. 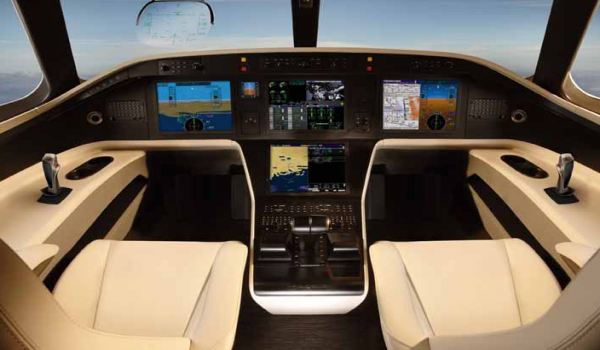 The aircraft is equipped with the state-of-the-art Rockwell Collins Pro Line Fusion avionics suite, featuring four 15.1-inch high-resolution LCD displays with a synthetic vision system and graphical flight-planning capability. Options unique to this class include the Embraer Enhanced Vision System (E2VS), which incorporates the new compact Head-up Display and the Enhanced Vision System, along with paperless operations and autobrakes. Storage space aboard the Legacy 450 is plentiful, with an in-flight accessible baggage compartment and external baggage compartment, both the largest in class. Passengers can access internal storage through the lavatory, which also offers vanity stowage space, along with hot and cold water and abundant natural light. 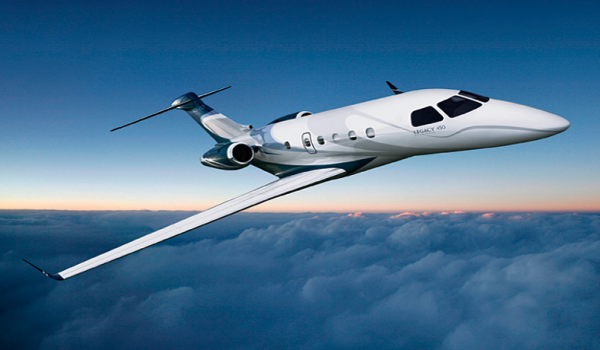 The Legacy 450 has met or surpassed design goals, exceeding targets such as range, runway performance, hot-and-high takeoff distance and maximum payload. It is powered by the two latest-generation Honeywell HTF 7500E turbofan engines, and can take off from airfields as short as 3,825 feet. In addition to being the greenest in class, its engines are the only ones in the category with “on-condition” maintenance. 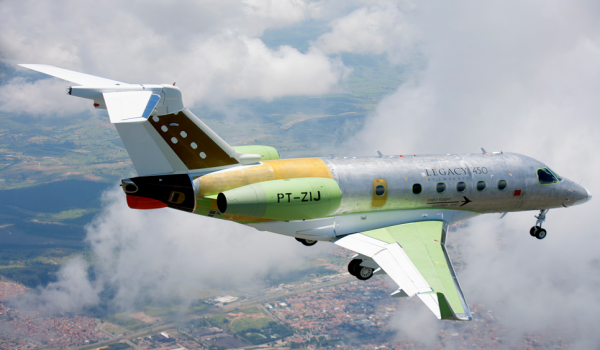 The mid-light jet’s impressive range enables it to fly nonstop from New York to Las Vegas, São Paulo to Lima, Dubai to Moscow and Jakarta to Hong Kong. Outstanding technology and performance, along with unsurpassed comfort and style, combine to make the Legacy 450 like no other mid-light jet in the air today.